Who does not like to play games on their mobile phones? Everyone likes it, especially the action games which are at the top of this list. But there are thousands of action games available on the market. Too many options come with confusion to choose the best one. Today we’ll be helping you by presenting to you one of the best combinations of strategy and action. 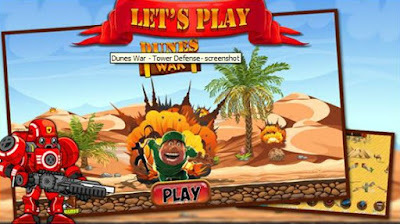 The name of the game is Dunes War - Tower Defense, a fantastic tower defense cross-platform gaming app, developed by Nathalie Palaganas. We were amazed when we saw the beauty of the game set, the storyline, the graphics and the powerful characters! Above all, it allows you to be the ultimate hero of your own virtual world! This game is a hybrid of tower defense, strategy and battle action. You will be playing through 24 challenging levels and you’ll have to show your best skills if you want to save the country. Use your resources to build high defense towers, improve the ones you already have to stop the enemies from coming in, block their attacks, but don’t forget to fight against them on the battle field. March with your heroes and with your trained people, defeat them using your best weaponry and ammunition, collect coins, fuel, chips and win! Unlock as many levels as you can, spin the wheel to get wonderful rewards and visit the game’s shop to buy what you need! We can’t really explain each feature of Dunes War - Tower Defense by writing about it, so we suggest you click the links below, download it and check it out for yourself. We’re pretty sure you’re going to love it!